Let’s assume that any decent martial-arts instructor has some skill. That really should be a given. Then why are some martial-arts teachers so much better at the craft of getting students to thoroughly learn their craft at a fast pace? How is it that some teachers inspire loyalty and spark enthusiasm while others come across as duller than butter knife? Is it a question of charisma? Charisma and a winning personality can go a long way, but it’s only one small component of master teaching skills. Lots of you know about the Pareto Principle — 20% of the top salesmen produce 80% of the sales, while 80%, the rest, make up only 20% of the sales. 20% of the magicians get 80% of ther jobs, etc…. Well, that principle has been magnified in martial arts teaching. 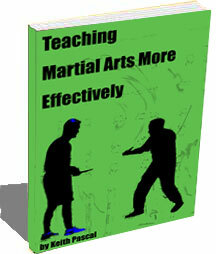 98% of the martial arts teachers are teaching the same ways, and only 2% of the teachers are using different methods. Sure, everyone could teach just the way they were taught, and the way their teachers were taught, and their teachers’ teachers were taught …. But that’s not an efficient model of teaching anymore. Times have changed. Students have changed. And the world has changed. We need new ways to teach martial arts more effectively. … helping you to become a better teacher. Exactly what you can change to make your students better. Miss one of these elements, and you could be hindering your students’ learning process. This book goes beyond giving you a collection of teaching techniques. If a new teacher were turned loose with a bunch of new techniques to randomly try, you might see improvement in the students, but more likely, you’d see some awful results. This won’t happen to you. Not only do you get a full chapter on Guaranteed Successful Implementation, but you get a chapter on The Art of Adding Ingredients … Without Spoiling The Soup. Another chapter that will keep you pointed in the right direction is The Best Ways to Use Evaluation to Your Advantage. Can you see how these three chapters alone will guarantee your success? Take an honest look at your students. Or, if you are yourself a student, then take an inward glance. Could your students use a complete martial arts makeover? If they could, there is a complete chapter, not surprisingly titled …. 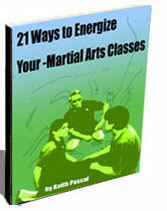 Give Your Students a Martial Arts Makeover. This chapter is packed with useful information, including The Power Method for Cranking Out Superior Students, two great models for creating superlearning exercises, and everything you’d ever want to know about students’ martial arts goals and shaping their behaviors. Other chapters in this eBook give you solid advice for creating the perfect class. Once you have learned to create classes that are a cut above everyone else’s, then you learn how to teach a super class, so everything flows smoothly. At the end of the book, you get a road map for making your students great. Does it feel like there are times when your students need a dose of enthusiasm? Do they need a shot in the arm? This eBooklet will energize your entire class — no more clock-watchers. Your attendance will rise. Your students will stay with you longer — you build loyalty automatically. You get 21 suggestions — many can be incorporated immediately. 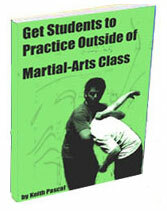 If your classes are dragging, then this eBooklet could be worth the entire price of Secrets of Teaching Martial Arts More Effectively. Pump up your students’ enthusiasm now! Learn the Three I’s of Teaching. This eBooklet gives you three important elements of great teachers. These three strategies are crucial to your success. Incorporate any one of these tactics into your teaching, and your students will see a change, for the better, within 72 hours. And they won’t necessarily know what the change is — the three techniques are that subtle. And that powerful. If you really want to know and use three elements of some incredible teachers out there, then this eBooklet is a must for you. You have been into the arts for awhile now, right? You know that it takes discipline to get better. In fact, martial arts is founded on the discipline to practice, right? We practice over and over, so we might react efficiently and effectively if a real need ever arises. So, why is it so difficult to get students to practice outside of class? Many of the readers of Martial Arts Mastery have asked me this very question. This eBooklet is my answer. After all, those who eventually see the value of, and can condition themselves to, practice stay in the martial arts. Those who never find ‘the religion’ of practice, seem fall by the wayside, wouldn’t you agree? These methods work. One of the techniques is called Piddly Practice. It is designed to infuse a dose of practice into even the worst couch potato. It starts a foundation — it gives you something on which to build a structure of practice … gradually, more and more. As I said before, these methods work. And when you combine them with Belts, Certificates, and Blueberry Muffins (Chapter 9 of Secrets of Teaching Martial Arts More Effectively), you have a winning combination guaranteed to get more of your students to practice on their own … for faster improvement. So, How Much Does This ePackage Cost? Right about now, is when I should pull out my credentials. 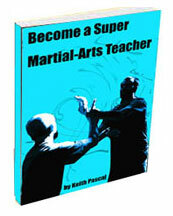 After all, who is Keith Pascal to write about teaching martial arts? Similar to many martial artists, I too have spent most of my life studying the martial arts. I am 50 years old, and even though I bounced from style to style in the beginning, I have been with one of the Bruce Lee Original Students since 1980. I took classes from him full time for eight years. Then I got spot checks a few times a year, and now it seems that I am back with him on a more regular basis (even though its a 5-hour round trip for each lesson). Beyond my 25+ years of Steve Golden influence, I have rubbed elbows with some of the very best martial arts teachers in the profession. And I have practical experience. I taught at the university level for two and a half years on a Graduate Teaching Fellowship. From there, I taught at the high school level for a dozen years. The whole time, I have also been teaching martial arts. I have a Master’s Degree in The Art of Teaching. I have collected over 1,000 positive teacher’s evaluations from my students over the years, and I have been listed in Who’s Who of American Teachers more times than 95% of all other U.S. teachers. I am mentioning all of this not to brag, but to let you know my passion for teaching and for the martial arts. In fact, I left the high school classroom, so that I can teach on a bigger scale — I have become a full-time martial arts writer and author. OK, so I have the credentials to write this ePackage — but what do these ebooks sell for? In fact, now that you think about it, did I mention all of my credentials in order to justify an inflated price? With a little quick research, I found that ePacakges in the business world go for an average of $67 to $395 with a low of $39.95 and a high of over a thousand dollars! Don’t worry. I am an honest and ethical writer. Before I tell you exactly what it does cost, would you like to know what the readers of the Martial Arts Mastery newsletter thought it should sell for? They didn’t know much about the package, other than the subject and approximate length. But they were accustomed to my writing from the weekly newsletter. They thought that the perfect price, for them, would be $60. You really should take advantage of this great offer. Normally, Kerwin Benson Publishing guarantees all of their products for 90 days. That’s a good guarantee. Kerwin Benson Publishing is confident that you will find this information both valuable and useful. Download your copy now, and you can start teaching more effectively in just a few minutes. PS. All of my books and ebooks come with a money-back guarantee.